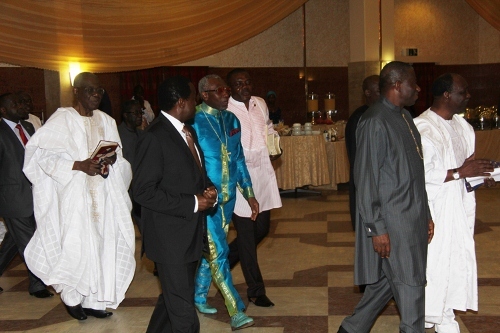 What is Ayo Oritsejafor wearing? When meeting presidents (past and present) of our Federal Republic, one always has to look their best, right? The Christian Association of Nigeria (CAN) president – a venerable man of the gospel, one must make haste to add – outshone his other presidential counterparts in his (just a little tight) blue and green outfit. Literally. What was the occasion? 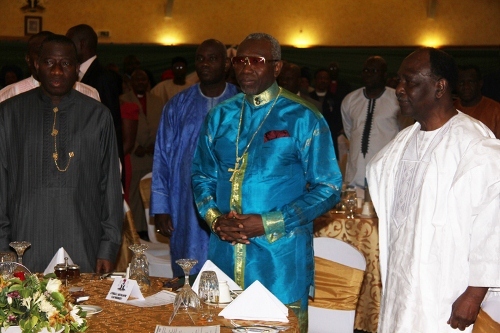 The second presidential prayer meeting, held at Aso Rock on May 14, 2012. Attendees included President Goodluck Jonathan, CAN President Bishop Ayo Oritsejafor, and former Head of State, Gen. Yakubu Gowon. Hahaha at this outfit. So ridiculous sha. Isn't it obvious? Bling Bling of cos!